From past few years, attributed to unprecedented climate change issues, global automotive industry is striving hard in developing light weight and innovative functional materials to improve vehicle’s fuel efficiency. Growing greenhouse gas emission (GHG) from road transport vehicles in association with amplified consumer awareness and energy security issues have led the automotive industry to develop light weight automotive components. Rising number of vehicles on road coupled with manufacturers inclination towards fuel efficiency and weight reduction is a major driver for the growth of automotive composite market. Apart from GHG emission and climate change, various other strategic and geopolitical concerns have also pushed the fuel saving measures in automobiles, especially in developed countries. The report covers the present ground scenario and the future growth prospects of the automotive composite market for 2016-2024 along with the total revenue of automotive composite industry in every region. We calculated the market size and revenue share on the basis of revenue generated per segment, region, and regional and country level. The revenue forecast is given on the basis of number of automotive composite manufacturers and current growth rate of the market. 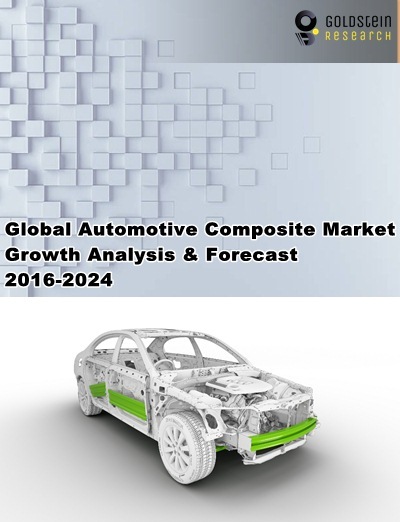 Automotive Composite Market report has been prepared based on an in-depth market analysis from industry experts. The report covers the competitive landscape and current position of major players in the global automotive composite market. The report also includes porter’s five force model, SWOT analysis, company profiling, business strategies of market players and their business models. Global automotive composite market report also recognizes value chain analysis to understand the cost differentiation to provide competitive advantage to the existing and new entry players. Our report comprises of the following companies as the key players in the global automotive composite market: Mitsubishi, Toray Industries, SGL, Toho Co. Ltd., Teijin, Cytec Solvay, BASF, Delphi, Johns Manville, Nippon Sheet Glass Co. Ltd., General Motor Company, DU Pont, Kineco Group, DOW Chemical Company and Johnson Controls, Inc.
Goldstein Research analyst forecast the global automotive composite market to expand at a CAGR of 8.7% during the forecast period 2016-2024. Further, the market is anticipated to reach USD 10.6 billion by the end of forecast period. Based on product type, polymer composites accounted for the largest revenue of 71% in global automotive composite market in 2016. Glass fiber composites acquired the largest market share of more than 80% in the fiber composite segment and the segment is likely to maintain its dominance with a CAGR of 6.5% over the forecast period. Geographically, Asia Pacific region accounted for the largest market share with 35% revenue share in global automotive composite market. Asia Pacific is closely followed by the Europe, which occupied about 28% of the market share owing to presence of big automotive industry players and huge automobile production in the region. The major countries of Latin America such as Brazil and Mexico showcase huge opportunity for automotive composite industry as the automobile manufacturing and sales are growing rapidly in these countries. According to our automotive composite market study on the basis of extensive primary and secondary research, one major trend in the market is the rapid adoption of carbon fiber composites in automotive industry. The automotive industry has gently expanded its used of carbon fiber composites and continued growth at a compound annual growth rate of 18.4% or higher is expected in the next several years. However, high cost of carbon fiber limits its use in some high end automobile variants only. On the other hand, small and medium ranged cars have been the focus for carbon fiber application for both price and production- scale reasons. According to the report, major driver in automotive composite market is growing environmental concerns and stringent emission norms. Automobile manufacturers are providing innovative composite parts in their vehicles in order to increase the fuel efficiency by reducing its overall weight. Moreover, the development of low-cost manufacturing methods for automotive composites is receiving a lot of attention, which is the major that can boost the growth of the automotive composite market. Further, the report states that one challenge in automotive composite market is high cost related to production of innovative composite materials such as carbon fiber composites. Material costs of carbon fiber composites are at least 20 times as much as steel and aluminum, and the automotive industry is unlikely to use them at mass scale until the price of carbon fiber drops significantly.